First, an important reassurance: this album has nothing whatsoever to do with that ambiguous but dreaded genre “ambient music.” Why it’s associated with a label called Next Ambiance, I have no idea; this is deeply felt, honest music, with strength and form and purpose and movement and emotion and intellectual appeal. Nothing ambi-pamby about it. Nor is there anything aggressive about it. Arising as it does from the Garifuna culture, like Andy Palacio’s acclaimed album Watina a few years ago, this is gentle music in the very best sense. Its melodies are sweet and lilting; its Caribbean grooves will guide you swaying and dipping smoothly across the dance floor; its instrumentation and vocals are varied but always balanced; its arrangements are inventive but never intrusive. Recorded partly in Honduras and Belize and partly across the ocean in Senegal, this album is a fitting follow-up to what Palacio had started (and is dedicated to his memory), further illuminating the rich musical values and rhythms of the Garifuna people. Of interest to Jahworks.org readers will be the very close link between these rhythms and those of reggae; you’ll be drawn immediately to the rocksteady, one-drop and even nyahbinghi-style beats that are all over the place, interspersed with various propulsive Latin and African sounding polyrhythms. Similar dexterity and variety show up elsewhere too. Although he’s a talented singer himself, Aurelio shares the vocal spotlight with several guests from Senegal (Youssou N’Dour, Njaaya – what a beautiful voice she has! – and a couple of the Orchestra Baobab lads), not to overlook the spirited backing provided by a group of village women back in Honduras. 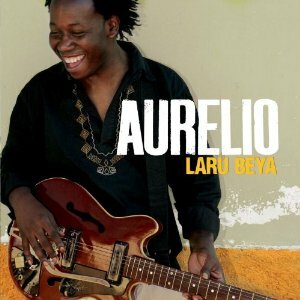 Without deflecting credit from the wonderful performances or from the raw material, it’s clear that much of the success of Laru Beya is due to the inspired arrangements by Ivan Duran and Aurelio himself. Notwithstanding the variety of drums and other percussion, the electric and acoustic guitars, the kora, saxophone, trombone, electric piano, organ, and more, the sound never suffers from overload or overproduction. There’s always space, always fresh air, no matter how much is going on. This is gorgeous music; Andy Palacio would be very proud to hear what he has inspired.